This post is late, late, late. I had somehow written it and crossed it off my mental list without actually posting it. I didn't realize until Kartik mentioned that he hadn't seen it yet! 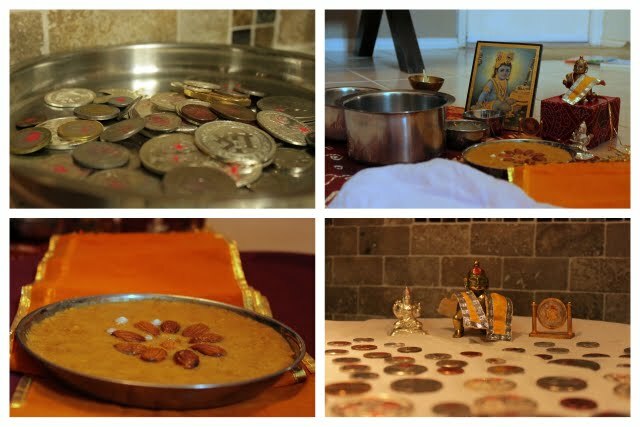 This past month we started off our week of celebrations (Diwali and Halloween) with a Dhanteras puja. This tradition comes from Kartik's side of the family. I had never seen or participated in this ceremony; but I had heard Kartik talk about it fondly for years. Because of where we live, we are surrounded (quite literally) with things, people and places from my childhood. It's so nice when we get glimpses of Kartik's childhood for both me and the kids. He talked about how his mom, dad and Mina Foi would sit with Sonu, Bhailu and him carefully moving coins from one dish to another. Of course we had Bunto! This year Dhanteras fell on weekday, so I spent a lot of Ishu's nap trying to get things ready. I asked Kartik a lot of questions while he was working trying to get everything just perfect. It's hard to recreate someone else's memory. We sat down in the evening to actually do the puja. Here is Ishu in his clasic 'jai-jai' pose. He'll always open his eyes to make sure that everyone else is also folding there hands and crossing their legs. I don't have many pictures of the ceremony (I was holding Amaani, while Kartik was directing Ishu). The ceremony involves washing coins; moving them from one bowl to another. Ishu, loved it! He loves playing in the water, he loves shiny things. Needless to say, Ishu ended the evening by dumping an entire pail of water on everything that you see above; the coins, the prasaad, everything was soaked. And I'm so glad he did... after we cleaned up everything, fed the kids and put Ishu I set to work rewashing the coins and finally got a chance to look at them carefully. I had assumed that all the coins were those silver ones with a engraving of Laxmi on one side. But these were all interesting coins that Kartik's Mom and Dad had collected over the years. Coins from different places, beautiful silver dollars and foreign coins. Kartik mentioned that they would add new coins each year, so I ran upstairs and added a few coins from my travels pre-kids. I felt so very blessed and honored to be able to participate in this tradition with him. Yes, we did this ceremony very fondly every year..the boys would be very exxcited to wash the coins and see the new ones added every year. I always cherish those memories...Glad you were able to be part of this tradition and hopefully carry this over for years so Ishu and Amaani can also enjoy this beautiful tradition! God Bless you all!! Rupa, It is a neat ceremony--somehow I'd never seen it done before. AB, Yes! It was so very wonderful! I have heard about you all doing this puja for quite some time now. Hopefully one of these years you two will be able to do it together again! It was lot of fun to do the puja with Ishaan and Amaani (sitting in my lap). We all should definitely get together and do this together both the kids will love it.